Emerson Creek Pottery creates 100% lead-free, hand-painted pottery that is stunning to look at and sturdy to hold. Created with the tender loving care of artists who truly care about their work, they have generated pieces that are functional too. You can put them in the oven, the dishwasher, and/or the microwave. We received the Blue Crab Onion Soup Crock a few days ago, and used it for soup last night. I love it! It's one of those dishes that just makes you happy to have in your house. 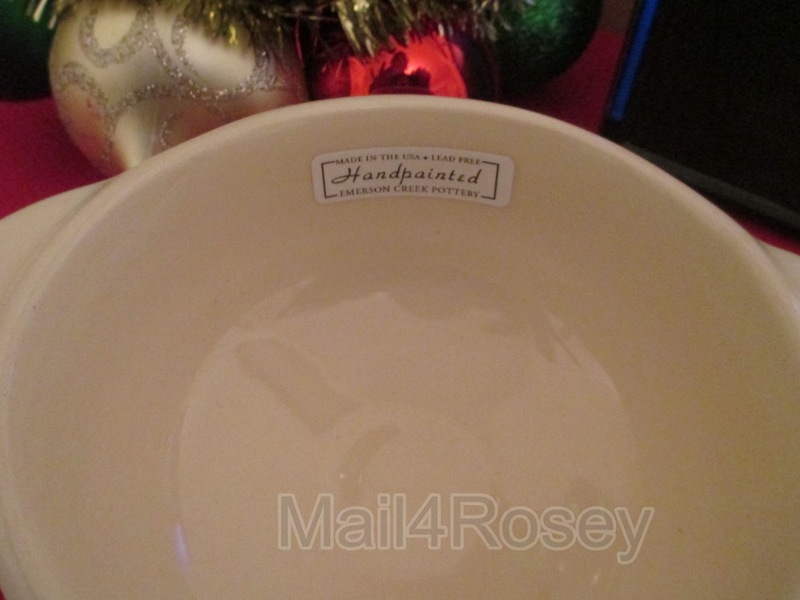 You can see on the inside of the bowl in the picture below that every piece has the hand-painted label on it. I love that each piece, though clearly part of a group, is special. The Emerson Creek website likened it to flowers in a field. I thought of snowflakes. There are many great designs to choose from too, but my favorite was the Blue Crab. It looked gorgeous online, and it looks even better in person. Also, it has these great little handles on the side, so if you're putting it in the oven, or under the broiler for a few, it will be easy to get in and out (I love those handles!). With the cold weather officially here, I know I am going to get a lot of good use out of my new crock. Many thanks to Emerson Creek Pottery, one lucky Mail4Rosey reader is going to win a crock of their own. The winner can select the beautiful blue crab, or there are twelve other styles from which to make a choice! In addition to these soup crocks, Emerson Creek Pottery has a very large selection of wonderful items! Take a look around and you will find things like this ceramic Cranberry-Pattern dinner set (perfect for serving Christmas dinner!). 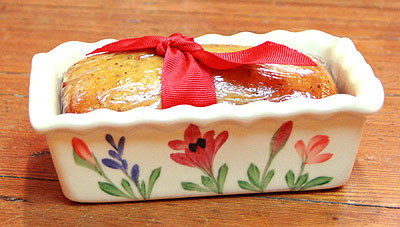 Or this gorgeous ceramic loaf pan (comes in two sizes), which I think would make a baked gift item even more special. There are many items in the Emerson Creek Pottery inventory for all areas of your house (not just the kitchen), and I think you'll really enjoy browsing through their website. Mail4Rosey readers, thanks to the generosity of Emerson Creek Pottery, can also receive a 20% discount for any orders of $25 or more that are placed between now and 1/9/13. Simply type the code: rosey into the coupon code space upon check out (Thank you, Emerson Creek Pottery!). You can find out more about Emerson Creek Pottery on their website. You can also follow them on Facebook, and/or check out their blog! Go ahead and read their Green Policies while you're there too...I think you'll be as impressed as I was at the measures they take to be good to our environment. Enter below on the Rafflecopter form to try and win your own Onion Soup Crock. Giveaway is for US entrants only. Good luck! Disclosure: I received an item to facilitate the review. No other form of compensation took place. All opinions stated are my own. I LOVE LOVE LOVE the Blue Crab Pitcher!!! I like the blue iris pie pan. LOVE the blue dragonfly onion soup crock! I really like the Iris Juice Pitcher! I love the lavender bathroom accessories! Their Handmade Ceramic Pottery is Made in the USA. I love baking bread so the loaf pans caught my eye. So pretty even if the bread doesn't come out right people will still think I'm a great cook. I really like the apple baker. I love the American Blue Tea Pot. 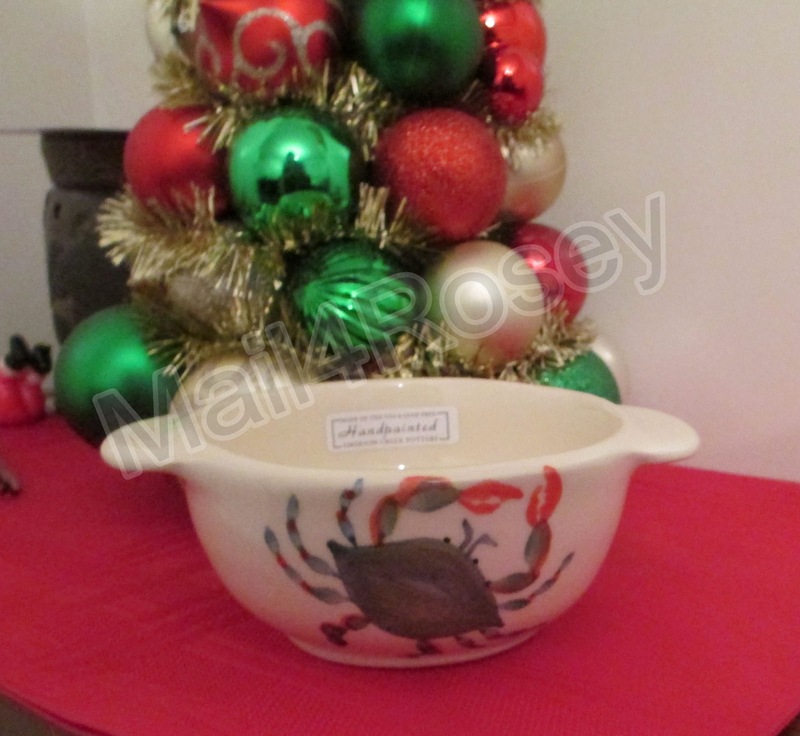 The blue crab onion soup crock is adorable! The Iris bathroom set is very nice. I posted on I caught Santa, as TreasureToday. 8 oz. Copper Clay Sugar Bowl is my favorite item. I like the 16 oz. Go Green Earthware Latte Mug as well. I like the copper clay dip cooler. I would love to have the red poppy dinnerware set for four--make that two sets of four. I left a comment on Holiday Greetings & Giveaway Winners! I love the Meadow Flowers Shortbread Pan .